This statistic displays the countries in the European Union (EU) with the lowest belief in the safety of vaccines, as of 2018. 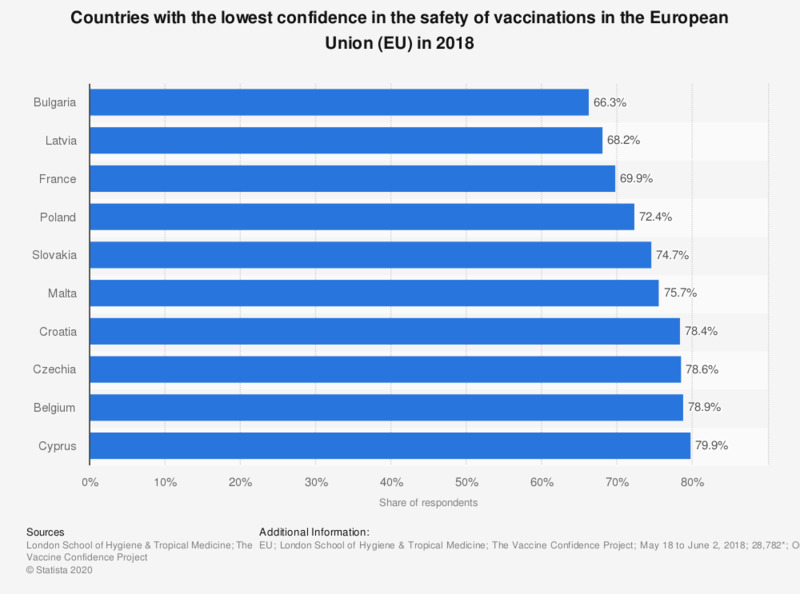 In this year, Bulgaria had the lowest confidence in the safety of vaccines in the EU, with approximately 66 percent of respondents believing vaccines are safe. The source provides the following information: "Each bar shows responses to of the prompt: 'Overall I think vaccines are safe'. * Total number for the EU as a whole. Approximately 1,000 respondents in each member state. Statistics on "Vaccinations in Italy"
Lately there is much talk of vaccinations. Which of the following statements come closer to your opinion? Italian government makes vaccinations mandatory for schoolchildren up to the age of 16. Do you agree with it? Are you in favor or against vaccinations to children and newborns? Are you in favor or against vaccinations to adults? What are the reasons driving you to be against vaccinations? In the face of a real health emergency (epidemics, meningitis, etc.) would you consider changing your opinion? Would you use vaccinations? Who do you think is mostly trustworthy for giving accurate information about vaccines?